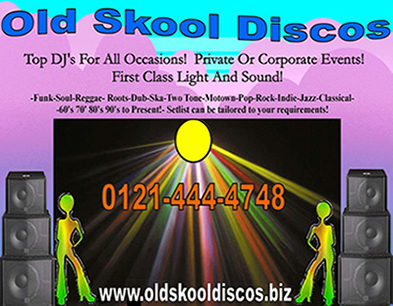 When it comes to organising a party its good to know that there is a professional company based in Birmingham, England, specialising in light, sound and providing top mobile DJ's and musicians. We play at wedding receptions, christenings, birthday parties, trade shows, gigs festivals, carnivals, themed parties and corporate events. In fact whatever your event we can help to create the right sound and atmosphere. We cater for specific music tastes and requirements or can play a wide variety of different styles for a mixed audience. We cover all of the West Midlands, however we are happy to travel to any part of the UK or abroad. We aim to provide a professional DJ, sound and lighting service for those who wish to have a successful well organised party in Birmingham and the surrounding areas. If you are celebrating and are looking for a class act our DJ, Sound and Lighting service will be just what you're looking for. I am a trained musician (Birmingham Conservatoire) and have worked professionally as a sax player and DJ for many years. I have worked with members of UB40, The Specials and The Selecter. So if your event needs an accomplished saxophonist as well as a DJ then look no further. Our powerful custom built state of the art PA rig brings 1st class sound to any room. We have adequate lighting to suit most venues and occasions. We treat our customers and with respect and tailor our playlist according to the guests attending this has been the key to our success so far. We use the powerful, impressive and versatile Kam LED Parbar shown in the video below as our main lighting rig. Press the play button below for a demo. All of our equipment is PAT (Portable Appliance Test) tested and passed by our electrician until 24th April 2014. We also have full Public Liability Insurance (Certificates Available On Request). Click below to see footage from some of our previous events!